The astonishing sequel to Children of Time, the award-winning novel of humanity's battle for survival on a terraformed planet. Thousands of years ago, Earth's terraforming program took to the stars. On the world they called Nod, scientists discovered alien life - but it was their mission to overwrite it with the memory of Earth. Then humanity's great empire fell, and the program's decisions were lost to time. And it's been waiting for them. Adrian Tchaikovsky is the author of the acclaimed 10-book Shadows of the Apt series starting with Empire in Black and Gold published by Tor UK. 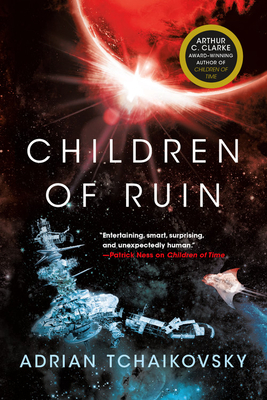 His other works for Tor UK include standalone novels Guns of the Dawn and Children of Time (which won the Arthur C Clarke award in 2016) and the new series Echoes of the Fall starting with The Tiger and the Wolf (which won the Robert Holdstock award in 2017). His work has also been nominated for the David Gemmell Legend Award and the Starburst Brave New Words Award. He lives in Leeds in the UK and his hobbies include entomology and board and role-playing games.